I have pain in the top of my foot, what could it be? If you have pain in the top of your foot, it could be due to several different reasons. Usually pain in your foot is from trauma or an incident you can remember happening. However, sometimes pain in the top of the foot may occur not due to direct trauma, but instead due to repetitive microtrauma. This can cause a stress fracture in one of the bones of the foot. A stress fracture is the breakdown of bone due to repetitive stress to the bone. It most commonly occurs in the long bones of the foot, or the metatarsal bones. The toes attach to the end of the metatarsal bones, and this is where your foot bends, or the ball of the foot. Some people suffer from ball of foot pain at the bottom of the foot; however, this pain may be different. In a stress fracture, the pain is mostly at the top of the foot and a little further from the base of the toes towards the midfoot. The most commonly involved bones are the 2nd and 3rd metatarsals, due to their length and the amount of pressure these bones endure in activity. These two bones of the foot are most vulnerable to stress injuries due to the force they must absorb during weightbearing activities such as walking and running and jumping. These activities cause the bones to buckle under the pressure, and may go from something as bone swelling, or edema, to increase in pressure causing microfractures in the bone. -Dull aching pain on the top of the foot. You may not be able to pinpoint exactly where, and it may move and may be diffuse. -Pain when you weight-bear or do certain activities. The pain may go away at rest. How Did I Get A Stress Fracture? Stress fractures most commonly occur in athletes, especially runners or those in sports with repetitive trauma to the foot such as sports involving jumping and landing. It can happen if an athlete advances training, too much, too soon, causing stress on the body. 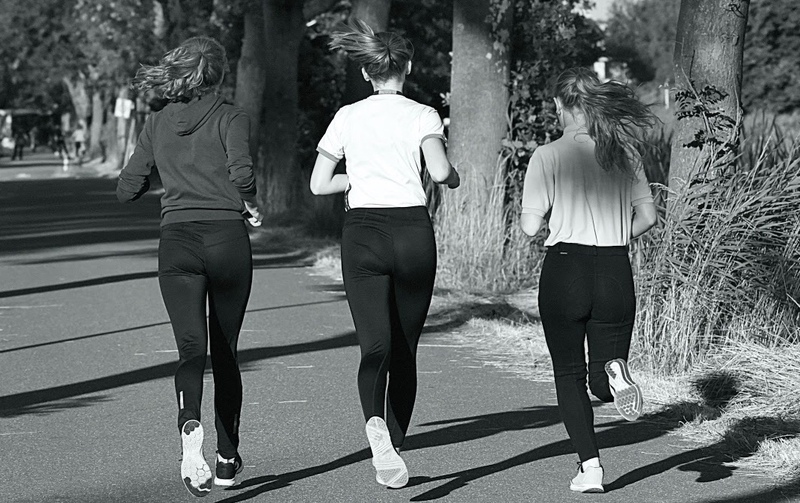 It is common in non-athletes as well, and it is due to a change in activity, an increase in activity, a change in shoe gear, or a change in work environment. These changes cause repetitive trauma to the foot, and your body is unable to adequately absorb the body weight forces. You may feel aching pain in your foot, with lack of trauma, from a few days to a week and notice that the pain is not transient and now affecting you daily. If stress fractures happen repetitively, your doctor may order blood tests to rule out osteoporosis or a vitamin D deficiency that may make you prone to stress fractures. The best way to treat a stress fracture is to see your podiatrist and get a proper diagnosis. Too often, our doctors hear the stories of a patient who went to the urgent care center because their foot hurts, they had an Xray of the foot taken, and sent home with no answer. The patient’s pain did not resolve, and then they come to our office for the proper diagnosis. Very often there are very subtle changes on the radiograph or maybe little to no evidence on radiographs of a stress fracture, as a stress fracture may not show up for 10-14 days after as the bone starts to remodel. Sometimes as the bone heals, there may be no change to the radiographs at all. The best way to diagnose a stress fracture is advanced imaging such as an MRI (magnetic resonance imaging) however a very good history and accurate pointed physical exam can give you an accurate diagnosis. Your podiatrist will take a combination of your history, physical exam, and radiographic findings to give you a proper and accurate diagnosis. After the diagnosis, is important to start treatment immediately; the sooner you start, the sooner you will recover. After a thorough exam and diagnosis, the most important treatment is immobilization. 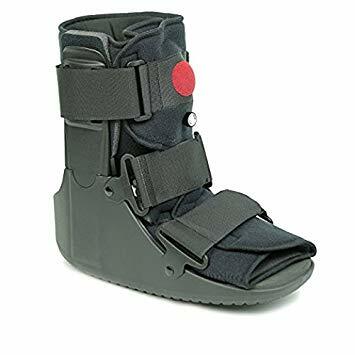 You will probably be fitted with a CAM boot (controlled ankle motion) boot that does a good job of immobilizing the foot, but still allows you to get around. The pain should be reduced to little or no pain in the CAM walker, but if you are still in pain, your doctor may recommend remaining non-weightbearing with crutches. You may stay in the CAM boot for anywhere from 3 weeks but it may take as long as 8 weeks or more, depending on compliance. The more you stay off your foot, the faster you will heal. Why Do I Need To Be Immobilized? A stress fracture may not be a full break across both ends (cortices) of the bone, but immobilization is still needed. I use this analogy when speaking to patients: You have two pieces of paper and try to stick them together. If the two pieces are moving, the glue will never dry. However, if you minimize the movement between the two pieces (immobilization,) then the glue will dry. If you think about this with healing, if you minimize the movement of the bone, the body is able to send growth and healing factors that will hasten the healing process. A CAM walker will provide adequate immobilization, but we have put patients in a below knee fiber glass cast if they do not feel relief after several weeks in a CAM boot; this may mean that they are not adequately immobilized and need to make sure the bone will heal. If you see your podiatrist, she will be able to rule out any other cause. If the pain is more at the ball of the foot, it can be a neuroma (inflammation of one of the nerves that cause aching and numbness that shoots to the toes) or a capsulitis (inflammation of the joint where the toe attaches to the foot at the metatarsal head.) 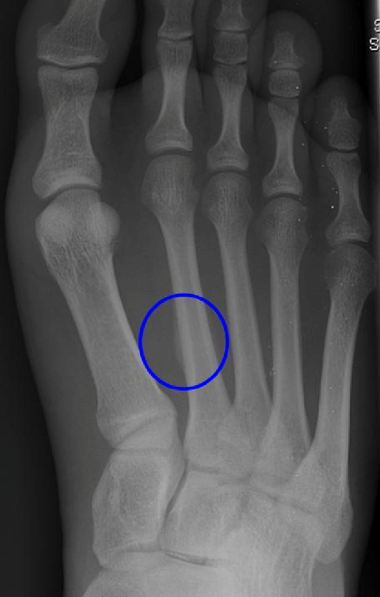 It could also be metatarsalgia, or pain in the end of the head of the metatarsal where stress fractures do not occur. If an area of the foot is swollen or red, your doctor will also rule out an infection or other trauma. It is so important to have your foot examined by a specialist, because a proper diagnosis is the key to pain relief and healing. Remember, pain is not normal! The best way to prevent another stress fracture is to pay attention to what caused it in the first place. -If you are an athlete, train wisely! Refrain from doing too much too soon; follow tried and true training plans. Cross train with non-weightbearing activities and listen to your body if the training is too intense. You don’t want to re-injure your foot! -Make sure you have the correct shoe gear! 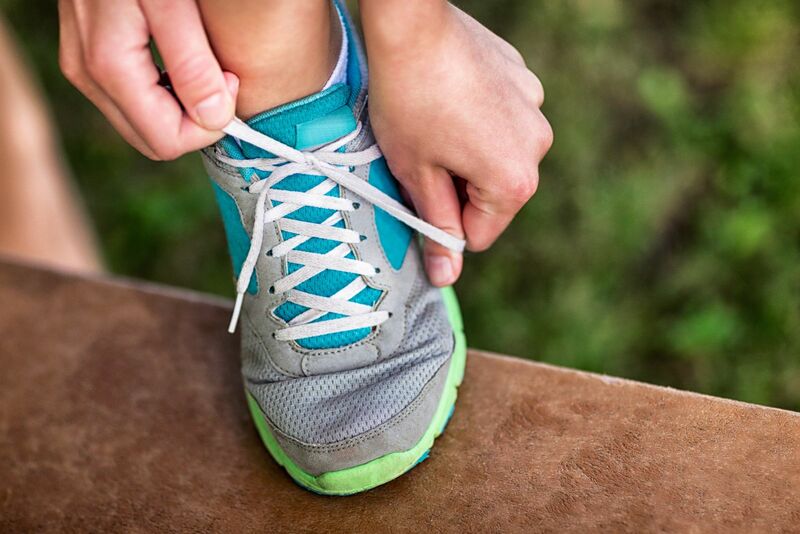 Shoes are sports specific, so make sure you have court shoes for those sports and separate running shoes for running. -Use orthotics. Our practice recommends custom inserts, or orthotics. We take a custom slipper mold of the foot and use the physical exam as a guide to write a prescription for the inserts. Custom orthotics are the key to continue to evenly distribute weight to the affected area. This may prevent the problem from returning. If you correct the biomechanics of the foot, then the areas of irritation are no longer aggravated, and your foot can function pain-free. -Address any medical conditions that may have contributed to the stress fracture. Proper vitamins and a healthy diet will prevent recurrence. If you have any questions regarding your foot or if you are ever in pain, call our office to be seen. Our doctors will do a thorough exam, and get you on your way with a full treatment plan and on your way to being pain-free.